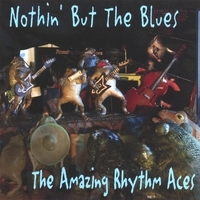 The Amazing Rhythm Aces is an American country rock group, which has characterized its music as "American music" or "roots music"—a blend of rock, country, blues, R&B, folk, reggae and Latino. The band is best known for its 1970s hit "Third Rate Romance". It has released 18 albums over 30 years (a period including a 15-year hiatus). The band's music is distinguished by its eclectic scope, literate and often quirky lyrics, and distinctive vocals by lead singer and songwriter Russell Smith. How the Hell Do You Spell Rythum?